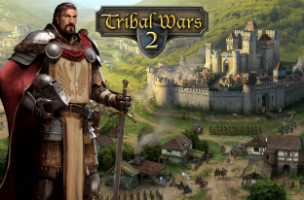 Online game developer InnoGames has announced the launch of Tribal Wars 2 in open beta. The strategy game takes players to a small village in a medieval setting, and challenges them to expand their empire while fighting to survive. Previously available in closed beta testing to a limited number of users, Tribal Wars 2 saw more than 300,000 players pre-register for the game. In Tribal Wars 2, players start with a single village, and must complete tasks by balancing the use of multiple resources, including clay, iron and wood. Like in other city-building / combat games, users can upgrade their structures, like military barracks, timber camps, farms and more, in order to increase their resource production and military power over time. Buildings like the timber camp and clay pit product base resources, while a warehouse stores them for future use, and so on. Once players construct a barracks, they can use that building to train defensive and offensive units for their military. Players start with access to just defensive spearmen, and must upgrade their barracks to unlock additional units, including swordsmen, archers, axe fighters, rams and catapults, among others. Out on the world map, players can send their units to attack other real-world players, as well as AI Barbarian villages. Strategy comes into play here, as gamers can decide which kinds of units to send, and in which quantities. Once assigned and triggered, battles take place automatically in the background, so players can jump back into their village and make more progress on upgrades and resource collection at the same time. A quest system guides players through the game, and asks users to build certain structures or upgrade others, but many of these tasks take time to complete. Tasks can be instantly completed with premium currency. Other premium items include boosters, which may reduce the build costs of buildings by a certain percentage, increase the production capabilities of a single building for a week, increase the storage limit for protected resources and more. There are boosters that apply to both the village and to the player’s army, so users can purchase items that fit their own style of play. For additional social gameplay, users can invite others to join Tribes, or alliances. Joining a Tribe unlocks a specific forum for Tribe members, where users can chat with others about the game, or even about other topics in the off-topic thread area. This Tribes feature is taken one step further via the ability to have allies, form non-aggression pacts, or even develop enemy relationships with other players. Tribal Wars 2 is available to play for free in browsers, and is planned for release on iOS and Android devices later this year. The game will offer cross-platform support, allowing users to take their account with them across devices and experience the same gameplay. For now, the game is available to play in English, with 17 more languages coming online in the future.